Here are instructions you can give to your friends who are coming to Kirkwood or Meadowstone for the first time. One easy way to give these directions is to just copy the URL from your browser's address bar and mail the URL in an email to your friends. Driving to Kirkwood - It is about 190 miles and 3.5 hours driving time from Menlo Park and the same from SF. The traffic issues are in the bay area (bridges and I-580 and Hwy-4) and around Tracy. The last 100 miles on highway 88 is a pleasant drive with no traffic. The typical snow level usually results in driving in the snow for only 15-30 miles. Best weekday departure times are either before 1pm or after 7pm. You should plan on adding an hour to the travel time if you leave mid afternoon due to congestion in the East Bay. If it is snowing, leave mid-day if possible (see below). You should have 4-wheel drive or chains. It can really dump on the pass and if it is snowing Caltrans will not let you though if you do not have 4x4 or chains. There is no gas station in Kirkwood and you should always have lots of gas when heading into mountain weather. You should fill up your gas tank when you are crossing the Central Valley or in Jackson, so that you head up the mountain with at least 3/4 tank of gas. If it is storming (or raining in the bay area), check road conditions before departure. The best numbers to call are the Kirkwood snow phone at 209-258-3000 and CalTrans at 800-427-7623 -- speak "88" for specific conditions. Another good number is the general Kirkwood switchboard at 209-258-6000 and press 0 for operator and then just ask the friendly operator for the latest into on Hwy 88.
sleep in a motel on highway 88 and come up the next morning. 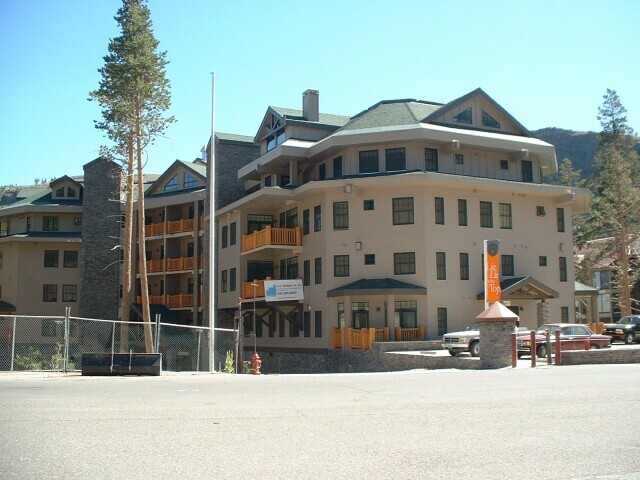 The two motels on 88 to consider are: The Creekside Inn, Pioneer Resort Lodge which is 40 miles down the hill from Kirkwood (209-295-3490) or The Best Western in Jackson, 50 miles down the hill from Kirkwood (209-223-0211). A short-cut that bypasses Jackson and saves a few miles is to turn left on Ridge Road as you approach Martel and Jackson. The turn is marked by a sign for "Sutter Creek - 3 (miles)," and it is just before a Ryder rental operation with a Paul Bunyon statue in front. Proceed straight through the stop light. Follow Ridge Road as it makes a left-hand turn uphill (6.9 miles from Route 88, marked by a yellow sign) at the junction of Climax Road. Turn left at stop sign where Ridge Road dead-ends back onto 88 East just before Pine Grove. From East of Sacramento and West of Placerville: Take Hwy 50 to Latrobe Road (El Dorado Hills); head South on Latrobe Road to Hwy 16 East which merges with Hwy 49. Follow Hwy 49 South to Jackson; from there head East on Hwy 88 to Kirkwood. From Sacramento: From Hwy 50 exit on Howe Avenue/Power Inn Road and follow the signs to Hwy 16. Take Hwy 16 East to Hwy 49 into Jackson; from there head East on Hwy 88 to Kirkwood. From Marin County: Go over the Richmond/San Rafael Bridge to Hwy 80; head East on Hwy 80 to State Route 4. Follow Route 4 East to Antioch and State Route 160; go East on Route 160 across Antioch Bridge and continue on to Rio Vista. 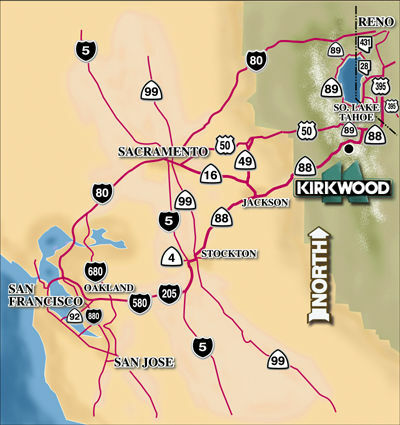 Take Route 12 East from Rio Vista through Lodi and go East on Hwy 88 to Kirkwood. From San Francisco: Go over the Oakland/Bay Bridge and take Hwy 580 East; take route 205 towards Tracy and merge onto Interstate 5 North. Go East on Route 4 to Hwy 99; go North on Hwy 99; exit on Hwy 88 and go East through Jackson to Kirkwood. 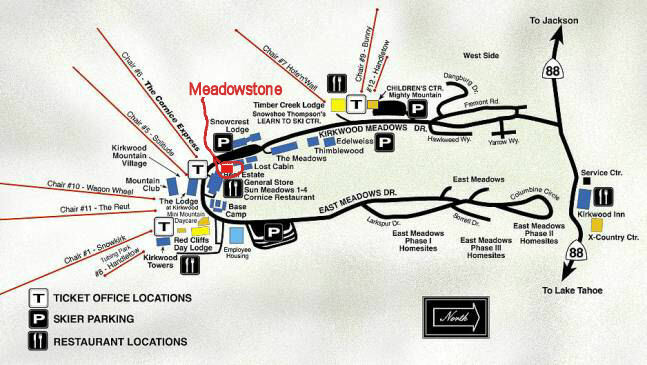 Meadowstone's location is circled in red in the below map. Here is what the Meadowstone Condo looks like from the street. You go down the driveway down to the left of the building to the garage. Every Condo has one parking space in the underground garage. If you're not the lucky one to park there, you can drive down into the garage to unload your vehicle, but then you'll have to park either in one of the few guest spots right in front of the condo building, or in the large parking lot a quarter mile further up the road. Guest parking spaces: are located in front of our building in a pad with 8 spots, and also on the street in front of the other (smaller) Meaddowstone building. You can use any free space but be sure to have a parking permit tag on your dash or else you'll get booted. Every Meadowstone condo can get 2 permit tags from the KCA offices. Garage: turn left down into the downhill driveway and drive down into the garage. You can open the garage door by going through either door (your keys will open them) and pushing the open button. You can unload by parking next to the back (left) elevator lobby. Meadowstone building has a front section and a back section. They do not connect. They each have separate elevators / staircases from the garage. .